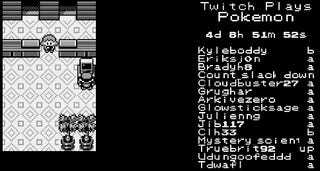 It has been nearly five days since Twitch Plays Pokemon, a stream that lets users collectively control a Pokémon game via chat commands, started broadcasting to the world. Since then, the stream has had over sixty thousand people watching and playing at once—as you might expect, it's been a chaotic, awe-inspiring ride so far. And while progress has been made, things have gotten a little...strange. Before we get into some of the many jokes, fan-art and Tweets made about the stream, let's recap on what's happened thus far, shall we? A helpful Google Doc has been set up that monitors progress—you should bookmark it, since it may be hard to stay on top of progress given that sometimes it takes hours to perform simple tasks. As of this writing, however, Twitch Plays Pokemon has acquired four badges, and the team line-up has featured an Oddish, a Rattata, a Flareon, a Drowzee, a Farfetched, and a Pigeot. If you've been watching, you know how amazing all of that information is—it's a wonder the collective players on Twitch is making any progress at all. Those playing might chalk all their good fortune to one thing: the Helix Fossil. Amusingly, because of the delay between when users say something in chat and when it actually happens on-screen, it became easy to accidentally select the wrong things on menus. 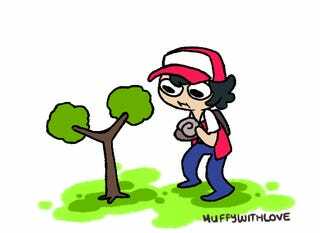 As a result, the character seems to compulsively check his item bag—specifically, he keeps trying to select the Helix fossil. You can't do anything with the Helix fossil until you bring it to Cinnabar Island in the games, at which point you can use it to revive Omanyte, an ancient fossil Pokemon. Still, the player "consults" the Helix fossil so much that people joke around about it as if it was a holy deity which the player uses for guidance, and that the real point of the entire thing isn't to beat the Elite Four, but rather to revive the old god, Omanyte. This is especially important when you consider how difficult some stuff has been—notably, there have been two big ORDEALS. At least one person—gibblegabs—has set up a real life shrine to the Helix fossil. 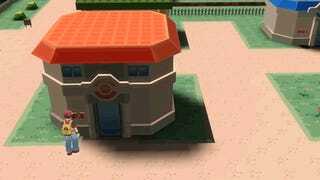 You can even ask the Helix Fossil for guidance yourself here. Unfortunately, at some point in the game the players on Twitch actually stored the Helix fossil in the in-game's PC—meaning, they still technically have it, but it's not actually in the inventory that you can access at any time. UPDATE: they've grabbed the Helix fossil back from the PC. HELIX HAS FORSAKEN US NO LONGER! This means its more likely that the player consults the SS Anne ticket, another key item which can be found in the same menu where the Helix fossil once resided. It, too is being treated as a kind of holy item. The Helix fossil is not the only thing that was lost along the way. A Rattata nicknamed "Jay Leno" and a Charmeleon nicknamed "Abby" were also released into the wild, sadly. Here's the GIF that captured the sad moment (click it to expand, if you'd like)—note that Jay Leno and Abby aren't the Pokemon's actual names, since it would be impossible to have the coordination to nickname any Pokemon something coherent. Jay Leno and Abby are just what the gibberish they were actually nicknamed most sounds like. As sad as this is, its what the Helix fossil willed, obviously. Another amusing thing that's happened is that Twitch managed to evolve the Eevee into a Flareon—one problem, though. They needed it to be a Vapereon, as that's a Pokemon that can learn the move "surf"—a move they'll need later in the game. They did manage to coordinate enough to go to the store and buy an evolution stone to transform Eevee, but they didn't have it together enough to pick the right thing. EDIT: A lot of the jokes refer to Eevee as an evil force that led players on Twitch astray because it would have been easier for everyone to take the free Lapras instead—trying to evolve the Eevee resulted in Jay Leno and Abby being released. Tragedy! Avoidable tragedy. If the Helix fossil is the savior, Eevee is the false shepard. 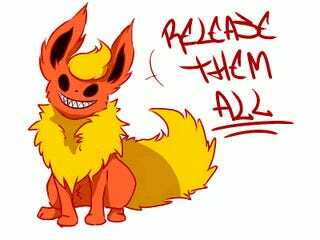 Some even blame the release of Jay Leno and Abby to Eevee/Flareon—and that it's only a matter of time before Flareon destroys everything. Heh. All of this is kind of weird, sure, but damn if its not fascinating too. We'll make sure to keep you updated where the Helix fossil takes players on Twitch next. Update: Curious as to how they're doing all of this? Then you should read How Players Actually Make Progress In 'Twitch Plays Pokemon.' The entire thing isn't as chaotic as it might seem!